About 150 dealers and distributors, product representatives and media representatives took a firsthand look at the latest electronics and thermal night vision cameras from FLIR Systems and Raymarine during a cruise aboard a 131-foot tour boat the evening before the show opened. FLIR Systems, which owns Raymarine (www.ray marine.com), installed the cameras and displays around the boat and took guests on a two-hour cruise on the Intracoastal Waterway. Teich gave a 20-minute presentation highlighting the new products. One of the latest products from FLIR is the First Mate MS, a marine scope that illustrates the company’s effort to lower the cost of thermal imaging, Teich says. Teich also touted the new e7 multifunction display from Raymarine, which serves as the “heart of the Raymarine electronics system.” It integrates an array of features, from touch-screen technology and Wi-Fi connectivity to Apple iOS and Blue Tooth capability, he said. “And it has a great suite of radar, sonar, and GPS and autopilot functions all built into the unit,” he says. At least 10 products were shown on the boat, says Haley Barclay, advertising and public relations manager. “We have at least five thermal cameras, from handheld to fixed-mount,” she says. I wrote an article for the November issue of Trade Only about Metan Marine Restorations, a Massachusetts company that restores SeaCrafts, Boston Whalers and other small boats. My story was generated mainly from telephone interviews with company owner Mike Borrelli, so I was eager to meet up with him at the Bahia Mar Yachting Center. Passionate, charismatic and fast-talking, Borrelli started restoring boats 14 years ago in a backyard hut made of shrink wrap over a wood frame. At his outdoor display at the show he told me about a reality cable TV show featuring his operation. The Discovery Channel had filmed for several months in preparation for the first episode of “Walk on Water,” scheduled to begin airing in the spring of 2012. Borrelli played a few clips from the program. Pushing his employees and himself, Borrelli holds nothing back on camera, often barking orders. I hope the program will feature some of Metan’s customers. I know from interviewing them that Metan does high-quality work (www.metanmarine.com). Sea Ray debuted two boats at the Bahia Mar Yachting Center: the 410 Sundancer and 190 Sport (www.searay.com). “We’re exceptionally proud of these two models, and there will be more to follow — new sportboats, new cruisers, big boats, little boats, jetboats and who knows what else,” says Mike Burke, Sea Ray’s vice president of sales and marketing. Powered with a 3-liter MerCruiser I/O, the 190’s top end breaks 40 mph; with the optional 4.3-liter engine, it tops out in the mid-50s, Burke says. “Our customers and dealers asked us for a boat under 20 feet with fresh lines, great performance and Sea Ray DNA, and we believe the 190 delivers,” he says. Knowing that attention to detail is the mark of a quality boatbuilder, Sea Ray vice president of marketing Rob Noyes showed me the “gull-winged” sun pads that sandwich the 190’s engine compartment. The pads use hidden lifts for clean access to the storage compartments beneath. He also pointed out the double gas lifts — two on each side — that hold open the engine compartment hatch. The 190’s show price was $39,900. The 410 Sundancer was designed to “adapt to the needs of customers around the country and around the world,” Burke says, referring to the boat’s ability to operate in a range of climates. The helm deck can be enclosed completely for warming or cooling the space. The hardtop’s sunroof and the bottom portion of the windshield open for ventilation. The boat is offered in two cabin layouts — a single stateroom and two heads or two staterooms and two heads. Standard power is twin 425-hp Cummins MerCruiser QSB diesels. Sea Ray also will power the Sundancer with Zeus pod drives in three options. Pursuit introduced its sixth new boat in the last 15 months, the Offshore 385. The OS 385, which replaces the OS 375 as the builder’s flagship (www.pursuitboats.com), rides the same hull as its predecessor, but has a new deck, superstructure and interior, says Pursuit marketing manager David Glenn. “This boat gives consumers some choices they didn’t have before in the interior, the hardtop design and the upper helm station control setup,” Glenn says. Below deck, the lighter woods make the cabin feel bigger, and the Fort Pierce, Fla.-based builder now offers an electrically actuated dinette table forward. “As it’s lowered and the filler cushions are introduced, it becomes a berth,” Glenn says. The galley is to port and the starboard-side head includes a separate shower. The aft cabin sleeps two adults. Pursuit engineered the non-skid-covered hardtop to take an optional tower and helm station, Glenn says. The OS 385 at the show was powered with triple 350-hp Yamaha 4-strokes. She can travel about 1 mpg at cruising speeds and has a range of more than 300 miles, he said. The fully equipped show model, with electronics and other options, was priced at $550,000. The 290 EC uses the same hull as its forerunner, the 280, but the deck has been redesigned, says Kelly Payne, director of design and product enhancement. “We needed an all-new look, but we had a tight budget and tight timeline,” Payne says. The 290 has a much cleaner, simpler profile and deck layout, he says. The cockpit size has been increased and the deck cap exterior has new styling. “We put a functional and aesthetic focus on this cockpit,” Payne says. “Now you board starboard and we have a logical serpentine-type flow from the walkthrough boarding area all the way to the companionway and the cabin.” Price is $76,000 with a MerCruiser 350 Mag MPI. With standard twin Cummins MerCruiser 600-hp diesels, the 54EU has a cruise speed of 14 knots, a top end of more than 18 knots and runs efficiently at displacement speeds, capable of more than 1,300 miles on a tank of fuel, Hensel says. The boat rides the same hull as the 53 Aleutian RP, but Grand Banks gave the 54 EU a new deckhouse, with new layouts on the flybridge and main deck. Lower-deck arrangements share a lot of similarities with the 53RP, Hensel says. The 150 FourStroke weighs 455 pounds and has a displacement of 183 cubic inches. The eight-valve engine weighs 55 pounds less than its predecessor, the 4-cylinder Verado 150, and can be used to power a variety of boats, from inshore bay boats and RIBs to offshore fishing and cruising boats, Miller says. The outboard also is a good choice for repowering, he says. “Because of the lighter weight you can mount the engines on older boats that normally could not handle the weight of an older 4-stroke,” says Miller, who gave a 40-minute presentation that touched on the exhaust system, engine oil cooler, 60-amp alternator and hydrodynamic gear case. However, the key point driven home was the engine’s weight — just 24 pounds more than Mercury’s 150-hp OptiMax 2-stroke — and its high displacement. The Mercury presentation listed the weights of its 150-hp 4-stroke competitors: Suzuki, 474 pounds; Yamaha 476 pounds; and Honda, 478 pounds. Touting the engine’s durability, Mercury says it tested the 150 FourStroke in some tough conditions, including 20-foot swells, says communications director Steve Fleming. The engine will be available in December at a retail price of about $13,000. Prior to Miller’s presentation, Mercury announced the winners of an online video contest it held this year, conceived during the brainstorming for a video on the 150 FourStroke. The engine manufacturer received more than 300 videos from Mercury owners in the United States, Canada and around the world, says Mike Shedivy, Mercury vice president of marketing. One of the winning videos was submitted by a family from Orleans, Ontario. It featured Kelsey and Kalan King — ages 9, and 7, respectively — performing a skit in which their broken-down engine from a competitor came to life when they placed a Mercury placard on it. The boys and their parents, Lonnie King and Linda Germain, were on hand for the presentation. The family received a Mercury outboard for winning; they had yet to choose the model. In other news, Mercury Marine announced it will be responsible for the worldwide sales, distribution, service and support of the Cummins MerCruiser Diesel (www.cmdmarine.com) range of high-speed diesel engine systems, including the Volkswagen TDI/SDI range, says Kevin Grodzki, Mercury’s president of sales and marketing and commercial operations. Mercury and CMD are still partners, and CMD will continue to oversee the production and distribution of the higher-horsepower models, which includes engines for the Zeus pod-drive system. “The market has changed, and what we found was that the customer base for the high-speed diesel market lines up very well with gasoline sterndrive engines and outboard engines, so we decided to take that piece of the [Mercury-CMD venture] — the high-speed diesels only — and shift that over to Mercury’s responsibility,” Grodzki says. CMD showcased a pair of its new TDI 4.2-liter diesels, marking the beginning of its relationship with Volkswagen. The German engine company manufactures and marinizes the 4.2-liter V-8, which has a 350-hp rating, and three other diesels (1.9-, 2.5- and 3.0-liter) under the CMD name. The 1.9-liter is an inline 4-cylinder engine with a 40- to 75-hp rating. The 2.5-liter, an inline 5-cylinder engine, has a rating of 55 to 165 hp. The 3.0-liter is a V-6 rated from 225 to 265 hp. Potential applications include twin 4.2-liter engines in boats as large as 40 feet, including express cruisers and sportfishing boats, according to CMD. The 350-hp engine also could find its way into large runabouts. Additionally, some of the diesels in the CMD lineup could be candidates for trawlers and sailboats. Amor showed me the Aqualuma third-generation through-hull light with a new end cap and LEDs that deliver 70 percent more light than the second-generation models. These lights are available now. In December, a new 12 Series light that fits into a 6 Series housing will be available, allowing owners of 6 Series products to upgrade without swapping housings. Also coming in December: a new surface-mount Aqualuma FF9 transom light made of the same polymers used for through-hull lights. “It’s a fantastic light, with no seals, no lenses, and it can be washed with acetone,” Amor says. Lastly, a new surface-mount spreader light available in dimming and non-dimming versions will hit the market before the end of the year. Northern Lights (www.northern-lights.com) and BAE Systems presented a hybrid propulsion system that can be installed in motoryachts, sailboats and trawlers. It teams a high-performance Lugger diesel with BAE’s HybriDrive (www.hybridrive.com). The traction motor connects directly to the drive shaft to supply power to the prop, or the energy is stored for its most efficient use, according to Northern Lights vice president Mike Maynard. “The system uses the diesel engine only when needed to reach its dedicated output,” Maynard says. HybriDrive technology is used in more than 3,500 buses, trucks and rail applications, Maynard said. “From what we have seen, HybriDrive is the only fully engineered and proven system on the market,” he says. HybriDrive consists of four main components: the diesel and attached electric generator, an AC propulsion motor, a propulsion control system and a battery bank. “There’s no mechanical connection between the diesel engine and any of these components — everything is electric,” Maynard says. The system has not been installed in a recreational boat and pricing is yet to be determined, Maynard says. OceanView Technologies (www.nightboating.com) showed its new SteadyView electronic image stabilization technology for use with its thermal, low-light and color imagers on Apollo cameras. A $3,000 option, the stabilization installs with little fuss, said CEO Michael J. Bader. “It stops the shaking image in its tracks and makes it dead still, and it’s shocking how well it works,” Bader says. The device actually manipulates the video image to compensate for the camera movement on a boat, Bader says. He gave me a demonstration in the show’s electronics tent by shaking the actual stabilization device (a black box about the size of a cable modem) while we looked at the thermal images. It worked well and improved an already useful technology. OceanView Apollo cameras run from $5,000 to $18,000 and are offered in 10 models, Bader said. Seven Marine showed its 557-hp 4-stroke after introducing the outboard last February at the Miami boat show (www.seven-marine.com). Two of the 1,000-pound V-8 engines were mounted on an Intrepid 370 Cuddy (www.intrepidpowerboats.com). Normally powered with triple 350-hp Yamaha outboards, the Intrepid achieves 75 mph with the 557s, says Ken Clinton, president of Intrepid Powerboats. The propulsion setup includes ZF Marine’s Joystick Maneuvering System, making the Intrepid the first production-built, joystick-controlled outboard boat. The boat was unavailable for sea trials. A section of one of the engine cowlings was open for show-goers to see the 557’s innards in action. The outboard uses a marinized General Motors LSA small-block V-8 and packs a slew of technology and features that consumers have been requesting, according to Seven Marine president Rick Davis. The Joystick Maneuvering System links to ZF’s CAN-bus controlled disc-clutch transmission and a ZF bow thruster. Another innovation is the closed cooling system, a first for the outboard industry, Davis says. Seven Marine had been sea-trialing the engines for about four weeks, said company vice president Sandy Ballou. The 6.2-liter outboard, which retails for $68,900, could be available in the fourth quarter next year. I stopped by the in-water display of Zeelander Yachts, the New Zealand company that’s carving out a niche in the high-end dayboat market with its Zeelander 44 (www.zeelanderyachts.com). It has tapped Tiara and Pursuit builder S2 Yachts Holland, Mich., to build the boats. Zeelander Yachts USA president Chris Holtzheuser showed me the first S2-built Zeelander, pointing out the workmanship and engineering that S-2 has brought to the table. Twin 435-hp Volvo Penta IPS 600 diesels push the boat to a top end of 38 knots, he says. The company has done well so far, selling 13 boats, Holtzheuser says. Price is $1.2 million. Navico (www.navico.com) introduced broadband 4G radar from Lowrance, Simrad Yachting and B&G. Broadband 4G radar delivers 50 percent greater range and target detection than broadband 3G radar and features beam-sharpening technology, which provides the sharpest possible radar images, according to the company. I had a chance to see the radar in action aboard a 39-foot Yellowfin center console at the show. The radar delivered sharp images as Navico spokesman Andrew Golden dialed in four radar displays. When networked with most display options, the 4G radar creates dual-range radar returns from a single scanner. The Lowrance, Simrad and B&G broadband 4G radars are compatible with the Lowrance HDS; Simrad NSO Offshore, NSE Expert and NSS Sport; and B&G Zeus multifunction displays. The radar becomes available in November throughout the United States and Canada. The Lowrance radar has a minimum advertised price of $1,899; the Simrad and B&G radars have a suggested retail price of $2,299. ZF Marine (www.zf.com) has made inroads into the recreational marine market with its engine transmissions, pod drives and joystick technology. 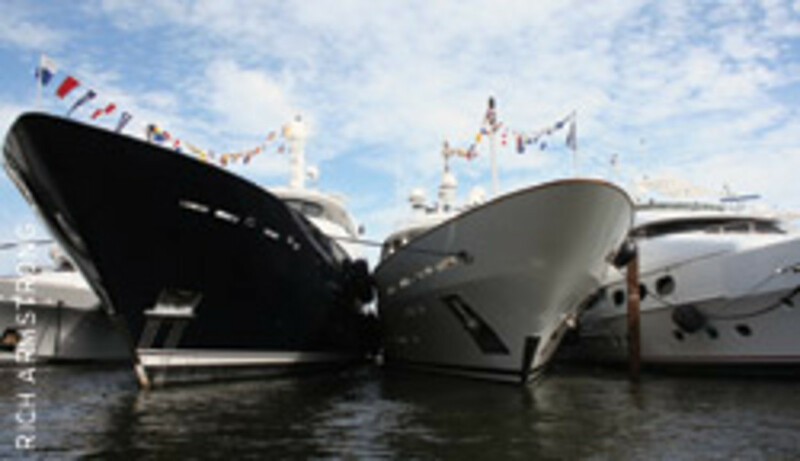 The company has packaged all three in a 50-foot Viking sportfish (www.vikingyachts.com). The ZF Pod 4000 propulsion system works with twin 1,150-hp Caterpillar C18 diesels mated to a ZF 500 series transmission connected to the pods. The propulsion system includes the ZF SmartCommand with Joystick Maneuvering System and SteerCommand electric steering. Two cameras were mounted on the hull bottom just forward of the pods to show their independent movement. The video was shown on two displays on the flybridge and another on a flat-screen TV in the saloon. The television not only showed the pod drives, but also an overview of the cockpit and the yacht’s wake. I drove the Viking for a while, using both the joystick and the standard throttles. ZF mounted a second joystick in the starboard armrest of the flybridge helm chair for seated operation. We also used the system’s iAnchor station-keeping feature, which operates the pods independently to keep the boat in place in varying current and wind. “The system is GPS-based and allows the boat to hold station anywhere on the globe down to about a 3-foot radius,” Meissner says. Although Honda held no formal presentation for its new BF250, the outboard certainly deserves mention (www.marine.honda.com). It’s Honda’s highest-horsepower outboard, and the company has given it a sleeker, more streamlined design. The BF250’s strengths include fuel efficiency and durability, according to Alan Simmons, Honda’s head of national sales and marketing. The manufacturer builds the BF250 with a 3.6-liter engine and a new gearcase that reduces drag by 5 percent, according to the company. A new air induction system uses two air-cooling methods for better combustion and performance. The engine weighs 600 to 622 pounds, depending on shaft length, with a displacement of 219 inches. Powering a 24-foot Carolina Skiff SeaChaser bay boat, the BF250 burns 5.2 gallons an hour for an impressive 5 mpg at 25 mph, according to Honda performance tests. At a top speed of 50 mph, it gets 2.3 mpg. Honda has made getting to the spark plugs easier via an access cover that eliminates the need to remove the entire cowling. The V-6 outboard will be available in 2012. Pricing was unavailable.